On the other hand, maybe its easier to install the complete EEC-GT3 mod too, its absolutely worth the work!! @ClimaxF1 wrote: For those who don't know how to convert and edit the skins or create new skin and veh. files here's a quick fix and something that quickly did for myself to have a bit of fun with GT4 mod until such time that there are some skins or skin packs for this mod. There are sixteen skins, four BMW's from @ThatAudiFan Bathurst skin pack, thank you! Five Ginetta skins from Shaun Clarke's GT4 skin pack, thank you. Then there are seven different Cayman GT4 liveries that I gathered and just made new windows and put them all together into one pack. If you look at the time that these skins were uploaded you will notice that the mod has being updated twice already. I'm not sure what changes were made as I have my own version, unfortunately I don't always have the time to make adjustments each time the mod changes. I suggest that you use the current veh. files as templates and make your own veh. files for the for the skin pack. I have all these skins and more running just fine. @ClimaxF1 wrote: I suggest that you use the current veh. files as templates and make your own veh. files for the for the skin pack. I have my FFB working properly on other cars including stock and EEC GT3 but with this mod my FFB becomes inverted on the track. Where should I look in the mod files to fix something like that? As I mentioned I run my own series of his cars and others so my files will be of no use to you. All skins have a veh file and you can edit them with notepad. Just make sure that the areas highlighted are the same as the current cars from the mod. 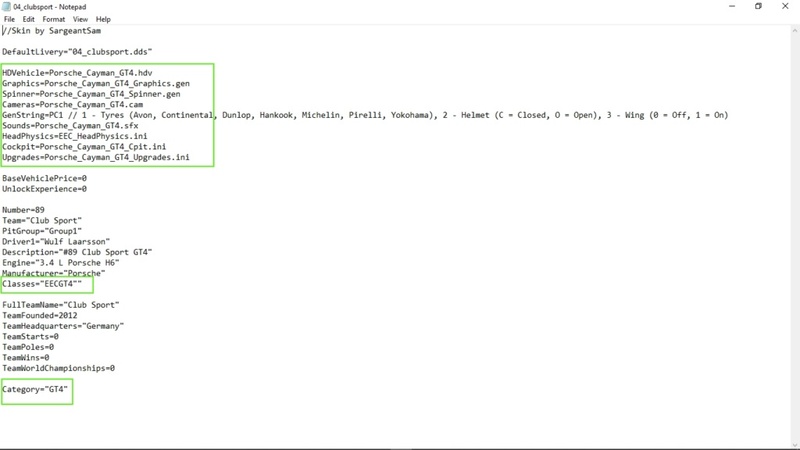 @ClimaxF1 wrote: All skins have a veh file and you can edit them with notepad. Just make sure that the areas highlighted are the same as the current cars from the mod. I'm sure it's related but not sure where to go from here. Ah, it was GenStrings. I noticed they specified something about tyres and that the new files were coded differently than the test car files so I used the Test Car GenString for the others and now they load up! @shovas wrote: I have my FFB working properly on other cars including stock and EEC GT3 but with this mod my FFB becomes inverted on the track. The steering might be reversed in RealFeel. Get in the car, push RightControl + 8 on the numberpad. I don't have RealFeel and couldn't find any files related to it. Is there somehow I might be using that without knowing? 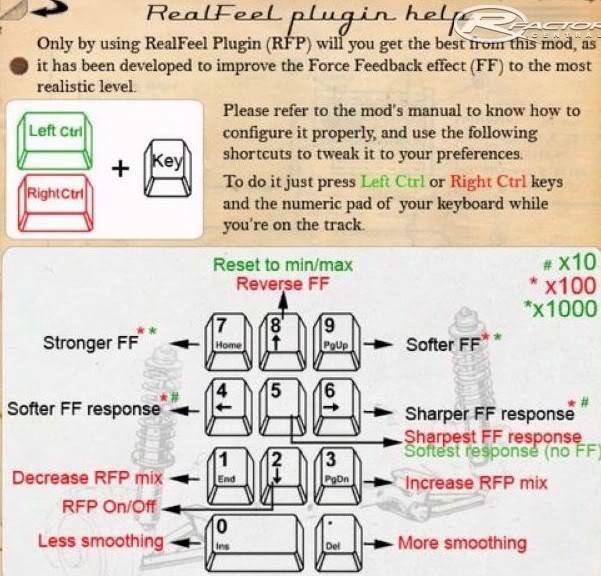 @shovas wrote: I don't have RealFeel and couldn't find any files related to it. Yes, it is included with AMS. It would be really nice to have skins for the remaining 4 vehicles, to make this the top class mod it deserves to be. Hi there, I have installed the mod, shows on menu, but icon does not turn red when selecting. In the car selection menu only the pace car ( Mini ) appears. Can you please assist my ignorance ? I was lead here by the Cayman skin pack by ClimaxF1 over on RD. Thanks for the mod! Cars look great! Good to drive. One thing I've noticed that I hope will be fixed in a future update is the dark shadow effect on the windscreen when you are in a shadow. I tried the Mustang, Aston, and Cayman, and all have this effect. I also had no cars other than the pace car listed but after reading through this forum I found the fix as listed a few posts above. I needed the EECMAPS.mas and EEC_HeadPhysics.ini files. Any chance to convert some old GT4 for this mod? Ginetta G50, Porsche 997 Cup, Lotus Evora and Maserati Gran Turismo? Or Add a style for the Aston without the rear wing? @mykill wrote: I was lead here by the Cayman skin pack by ClimaxF1 over on RD. Not really sure if this will be patched, I'm not a modder, Sam does all the hard stuff, I just pack everything together. I'll ask him about this, although haven't spoken to him in a while. @Gaudelio26 wrote: Any chance to convert some old GT4 for this mod? Ginetta G50, Porsche 997 Cup, Lotus Evora and Maserati Gran Turismo? Or Add a style for the Aston without the rear wing?